The automotive industry faces ongoing challenges meeting fuel efficiency, reliability, and cost targets. To address fuel efficiency challenges in internal combustion engines, OEM manufacturers are evaluating technology advances in multiple areas including reduction of piston assembly friction. For example, Diamond-Like Carbon (DLC) coated piston rings are deployed in some production vehicles for friction reduction and wear performance improvements. 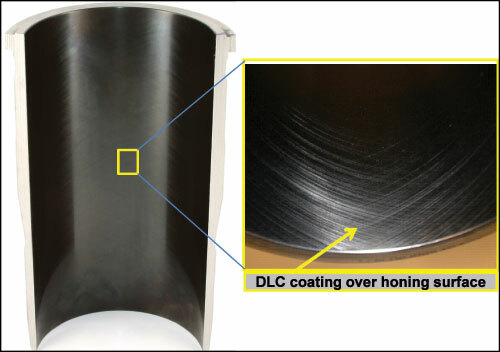 However, traditional vacuum deposition methods limit DLC coatings to external surfaces and require long, multi-hour coating cycles to deposit the thinnest of coatings. InnerArmor technology applies DLC coatings on internal surfaces, deposits over 150 times faster, and still delivers strong friction, wear, and corrosion performance. Leveraging this performance on the assembly line, InnerArmor DLC coatings enable parent bore aluminum engine blocks, eliminate the cost and weight of cast iron liners, and deliver 2%+ fuel efficiency improvement. Traditional cast iron engine blocks utilize parent bore configurations which withstand sliding wear from piston rings across the target engine life. Many OEM manufacturers are utilizing lightweight metals (e.g. aluminum) in an effort to reduce overall engine weight, but these soft metals do not offer the wear resistance required to meet engine life targets. To overcome this issue, cast iron liners are typically utilized in engine bores to meet wear performance requirements for the piston assembly. In an effort to further reduce weight and cost, OEMs are now looking for alternatives to cast iron liners. Plasma spray coatings are being evaluated as an alternative. These coatings offer a wear resistant surface which protects the engine bore from piston ring wear and claim to support improved fuel efficiency. However, these technologies require significant pre and post bore processing to create the desired surface condition. Patented InnerArmor® is a revolutionary process for depositing hard, smooth, near frictionless coatings on internal surfaces. Similar to traditional DLC processes, InnerArmor coatings offer high hardness, low coefficient of friction and strong wear resistance. Unlike traditional DLC processes, InnerArmor supports conformal internal surface coverage, 150x faster deposition rates, and much higher thickness without changing surface properties or sacrificing performance. InnerArmor coatings can be applied to most metallic surfaces, require no change to the bore preparation process, and allows for lightweight parent bore engine blocks. The end result is improved fuel efficiency, greater reliability, and lower operational costs. The InnerArmor process is a Plasma Enhanced Chemical Vapor Deposition (PECVD) process which utilizes precursor gases to form coatings on the internal surface of a part. Unlike traditional PECVD processes, the InnerArmor process uses a hollow cathode discharge (HCD) to generate extremely high density plasma within the part. This intense plasma enables rapid growth of a DLC based film with strong adhesion and low residual film stress. The “part” interfaced with the anode housing becomes a vacuum chamber, and the process is applied continuously across the “part” interior. The InnerArmor three phase process starts with heating / surface preparation, then applies an adhesion layer, and finally produces a layered DLC coating. Cleaning, adhesion, and process gases are delivered to the entrance head (left side of figure 1). The gas then travels through the “part” (e.g. cylinder bore) where it is intensely ionized by hollow cathode discharge. At the exit head, a vacuum pump and throttle valve are used to control operating pressure and pump out any reaction by-products. The “part” is a critical element of the plasma electrical circuit serving as the negatively biased cathode with respect to positively biased anodes located in the entrance and exit anode housing. The anodes are electrically isolated from the cathode by insulating spacers. The cathode bias plays an important role in reducing stress and improving the density and adhesion of the films by controlling the ion bombardment energy. Under suitable vacuum conditions, an asymmetric pulsed DC waveform is used to maintain high density plasma inside the “part”. Energetic positive ion bombardment is controlled by the magnitude of the applied voltage and pressure. 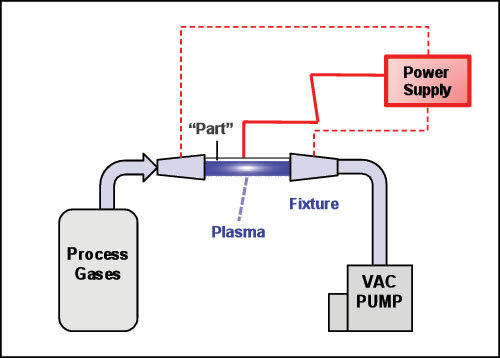 Gas flow and pumping speed are varied so the pressure inside the “part” provides a regime where a hollow cathode discharge can be maintained under the applied component voltage. This pressure is such that the electron mean free path is within an appropriate ratio to the “part” diameter causing high energy electrons to oscillate (pendulum motion) across the opposing cathode walls resulting in multiple ionizing collisions and two orders of magnitude higher ion-density than a standard discharge plasma. Key cylinder bore coating challenges include wear performance, surface roughness, coefficient of friction, and deposition rate. Starting with the adhesion layer, one or more gases are utilized to build the coating stack. The result is a multi-layer coating which can be customized to the operating environment by adjusting gases, flows, pressure, and power. The following sections describe how InnerArmor coatings meet the challenges. For aluminum engine blocks, manufacturers have traditionally utilized cast iron liners to protect against piston wear on the cylinder bore. A coating applied to the aluminum bore needs to increase the surface hardness and to be thick enough to prevent deformation of the aluminum substrate. Applying an InnerArmor DLC coating to the engine bore creates a very hard surface which can be adjusted from 1000 Vickers to 1800 Vickers depending on the engine environment. Although typical DLC coatings are very thin, InnerArmor coatings can be tuned to support from 2 to 15 microns thickness to provide the necessary protection for the life of the engine. Since the InnerArmor process is optimized for internal surface applications, consistent adhesion, thickness, and hardness properties are achieved throughout the engine bore. 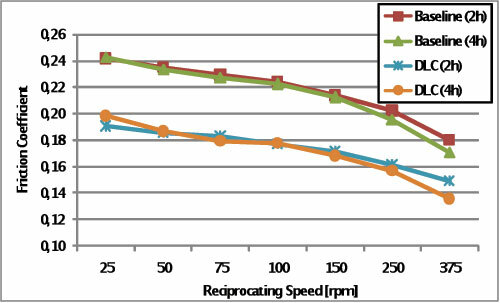 Figure 2 shows the results from ASTM G133 linear reciprocating sliding wear tests. An uncoated stainless steel 304 sample (~200 Vickers hardness) was compared against a coated stainless steel 304 sample in a dry test. The coated sample showed a 10,000 times improvement in wear performance as compared to the uncoated stainless steel. The InnerArmor process is applied after the bore processing has been completed. Unlike most spray coatings, no special pre or post processing of the surface is required for the coating. The coating mirrors the surface roughness of the substrate, and honing marks and other features are not affected by the coating process. Figure 3  shows an InnerArmor coated diesel cylinder liner which was prepared using the current production process (i.e. no special processing was required before the coating). The hone marks are visible on the liner. After the coating process was complete, no additional surface processing was required. Figure 4  shows a comparison of the Rk, Rpk, and Rvk measurements before and after coating at two different distances (30, 90 mm) from the top of the cylinder face on a diesel cylinder liner. 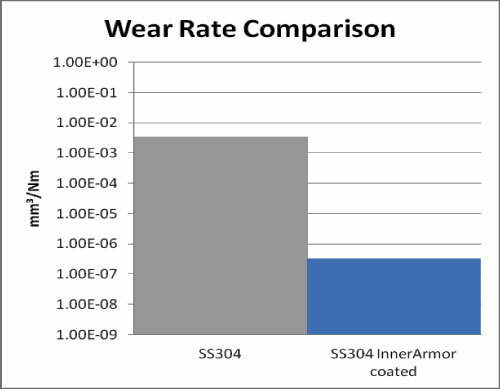 The measurements demonstrate that the InnerArmor DLC coatings are very similar to the original surface measurements. DLC coatings consist of a combination of SP3 (diamond) and SP2 (graphitic) bonds which provide a very hard, slick surface. As piston assembly friction accounts for up to 7% of fuel usage , reducing friction is a key target for automotive manufacturers. A tribometer was used to measure the coefficient of friction (COF) of InnerArmor DLC coated and uncoated cylinder liner pieces soaked in oil. The counter surface for the testing was a chrome nitride coated piston ring. Multiple reciprocating speeds and two load levels (50, 100 Newtons) were measured during the tests. Each test started with a break-in period followed by testing at multiple speeds and load combinations. 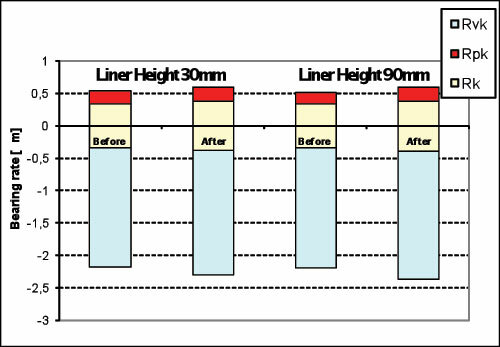 Figure 5  shows the COF measurements for baseline uncoated and DLC coated cylinder liners. Measurements were recorded 2 and 4 hours after the completion of the break-in period. The coated cylinder liners achieved a consistent 19% COF improvement across the range of reciprocating speeds. Engine tests with multiple parties prove that friction reduction translates into improved fuel efficiency in an engine. Detailed results are proprietary information. However, engine testing has demonstrated 2%+ fuel efficiency improvement over a range of engine speeds. Traditional vacuum-based DLC processes deposit coatings at 1-2 microns per hour and are too slow to deploy in an engine assembly line. The InnerArmor process utilizes high intensity hollow cathode plasma to deposit a DLC coating at rates exceeding 5 microns per minute. With custom tooling, all bores in an engine block can be coated simultaneously. 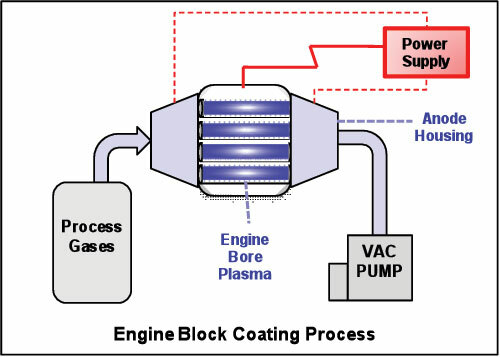 Figure 6 shows a conceptual diagram of the engine coating process. The engine can be mounted in a vertical or horizontal position for the coating. The anode housing interfaces with the engine block and forms a vacuum seal across all four bores. The engine bores are pumped down, and the plasma process is initiated to heat and prepare the bore surfaces for coating. After the heat cycle completes, the InnerArmor process simultaneously coats each bore using an isolated process. After coating, the engine bore is moved to the next station in the assembly line and requires no further bore surface processing. The deposition time varies with coating thickness but is about one minute for a 5-8 micron thick coating. Phase 3 – Integrate the coating process on the engine assembly line. Sub-One licenses InnerArmor technology for assembly line integration. Much of the vacuum technology consists of off-the-shelf components (e.g., vacuum pumps, valves). Sub-One provides the process control expertise, power supply, and operating software licensing to support the coating process.